China’s new buzzword is “decisive”. That’s how the ruling party described the role it wants markets to play in the economy. It’s hard to see whether it’s more than just talk. But there are four visible ways to tell whether China means business. China has no market for financial failure. No domestic bond has ever defaulted, which means prices for corporate debt don’t reflect true credit risk. A couple of near misses were avoided last year when local governments stepped in. A default could push up yields on most corporate debt, and cause ripples across the balance sheets of commercial banks, which account for 70 percent of trading in the market. It would also challenge the received wisdom that regional authorities will support local industries at any cost. The country’s $3.7 trillion pile of foreign currency reserves – enough to pay for two full years of imports – is the most compelling proof that China’s trade is distorted and unbalanced. The main cause is an undervalued currency that benefits exporters but penalises consumers. There’s no “right” value of the yuan that will convince opponents the market is doing its job. But a good yardstick would be if the relentless build-up of reserves, which increased by 11 percent in the year to September, went into reverse. China imports too much of some commodities, like iron, pushing up prices. Steel mills receive cheap power and credit, which lets them ramp up production even when their profits have run dry. In agriculture, China imports too little, because of its misguided pursuit of near self-sufficiency in grains. Irrational stockpiling has distorted prices further: China sits on two-thirds of the world’s cotton mountain, bought at high prices to keep its farmers in business. Letting market forces work would help to better allocate capital, but cause huge volatility. Many state-owned enterprises are listed on the stock market, but are a long way from privatisation. Though leaders have vowed to keep the “public sector” dominant that’s not incompatible with letting poorly managed companies fail. Allowing an SOE to be taken over – even by a foreigner – would be contrary to everything socialist leaders hold dear. For that reason, it’s hard to think of a more decisive way for China to show the market is working. 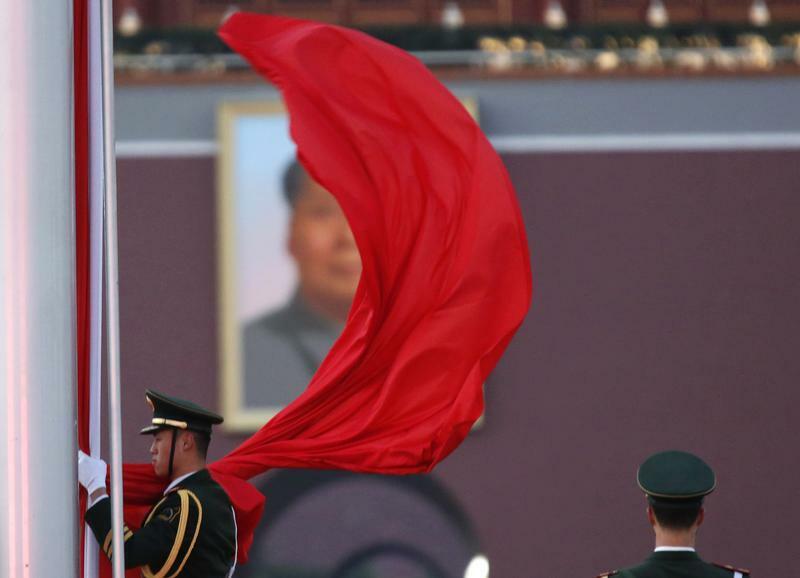 A paramilitary policeman holds the Chinese national flag at a flag lowering ceremony on Tiananmen square next to the Great Hall of the People, where the closing ceremony of the Chinese Communist Party plenum is going to be held on Tuesday, as the portrait of late Chinese Chairman Mao Zedong is seen in the background in Beijing, November 11, 2013. China's financial paradox: rescue or reform? China’s ruling Communist Party pledged to give market forces a “decisive” role, in a missive issued at the end of a symbolic plenum on Nov. 12. That marked a change of tone from previous mentions of the market’s “basic” role in guiding the economy. The statement, released to mark the end of the “third plenum” of the Communist Party’s central committee, called for comprehensive deepening of reforms, under the banner of “socialism with Chinese characteristics”. The plenum is the third meeting of the party’s top officials since new leaders were instated in 2012.